We had another lucky trip today cruising through the thick fog bank that has settled over Stellwagen Bank. A brief clearing in the fog allowed us to spot the location of a few different whales within a couple miles. The nearest spout was none other than Osprey’s. Per usual, Osprey was creating bubble nets and lunge feeding at the surface of the water. Today, Osprey’s lunges were shallow but often, occurring within a new cloud every minute or two. A half a mile further onto the bank, Grackle, a male humpback born to Zebra in 1997, was also bubble net feeding on his own. This solo show didn’t last long as Grackle swiftly made his way towards a very active male humpback named Rocker. First seen in 1990, Rocker is at least 24 years old but may be much older than that since we don’t know exactly when he was born. As we approached, the circling birds made it apparent Rocker was feeding but he was also creating large splashes with a number of chin breeches! Once these two males met up, they continued to feed together using a shared bubble net. It appeared that Grackle, diving first, was making the bubble nets but the duo surfaced together each time. Grackle very slowly filtered out his food on the surface of the water while the seagulls scavenged. Rocker, being a little more active gave us a couple chin breeches throughout the feeding session which guests absolutely loved! Towards the end of the whale watch as the fog started closing in on us again, an unknown humpback whale started zeroing in on the duo perhaps to join in on the collaboration. Before making an ID, we unfortunately had to disappear through the fog and make our way back to Boston! 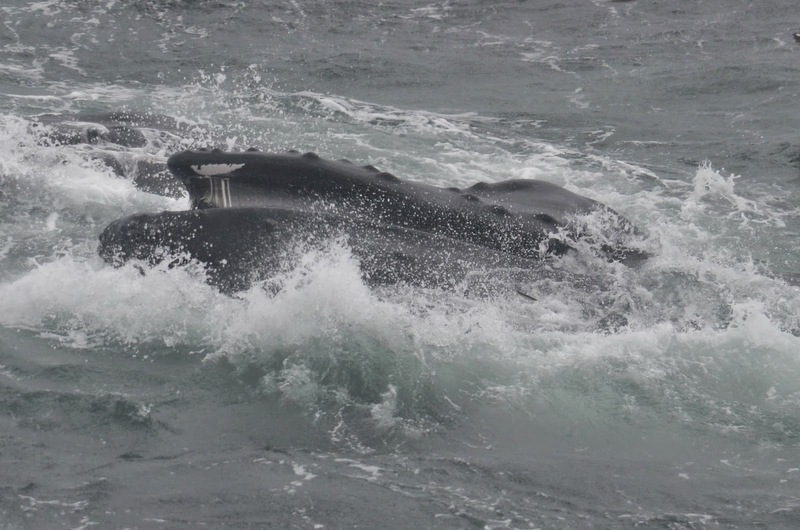 Today on board the Cetacea's 1:30 trip we traveled to the southwest corner in the thick fog and rough seas. 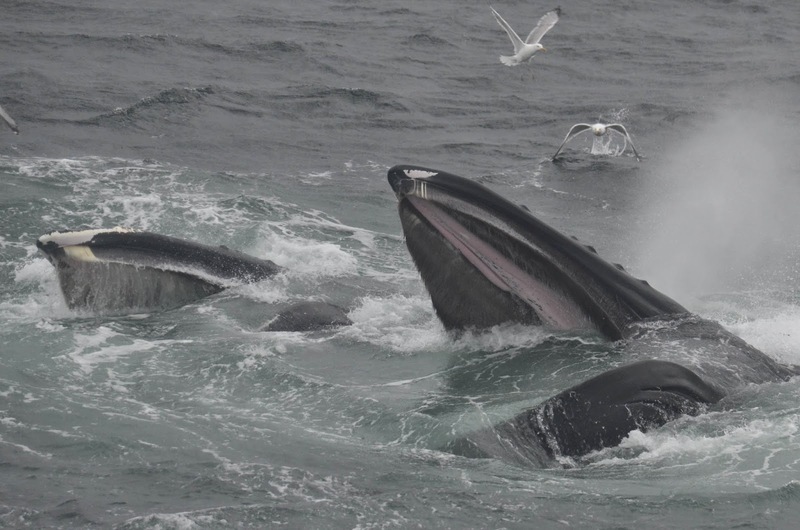 When we arrived we found one lone humpback whale that was bubble net feeding. It was Osprey! We stayed with this individual for the majority of our trip because it was treating us to some great close looks at bubble net feeding. Next we moved on to two further exhalations, that turned out to be Rocker and Grackle. The two were bubble feeding together as great team. We also spotted a few minke whales in the distance. 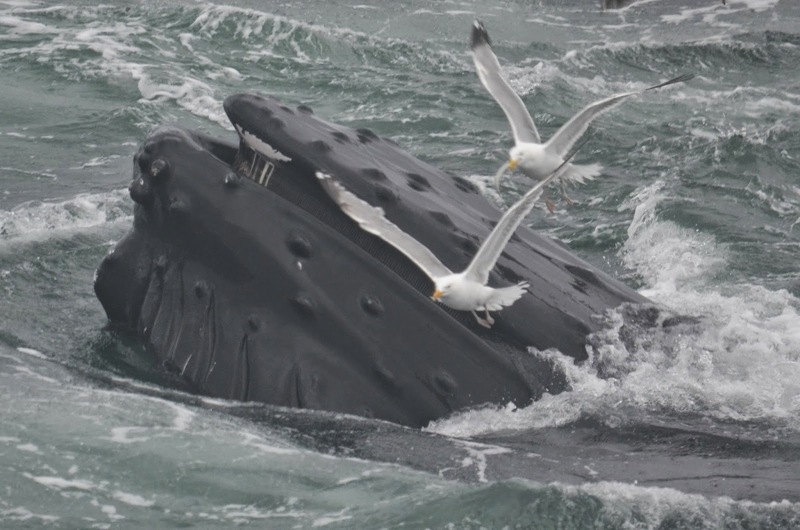 Humpback whales can be identified by the distinct shape of their dorsal fin, as well as their fluke or tail pattern. 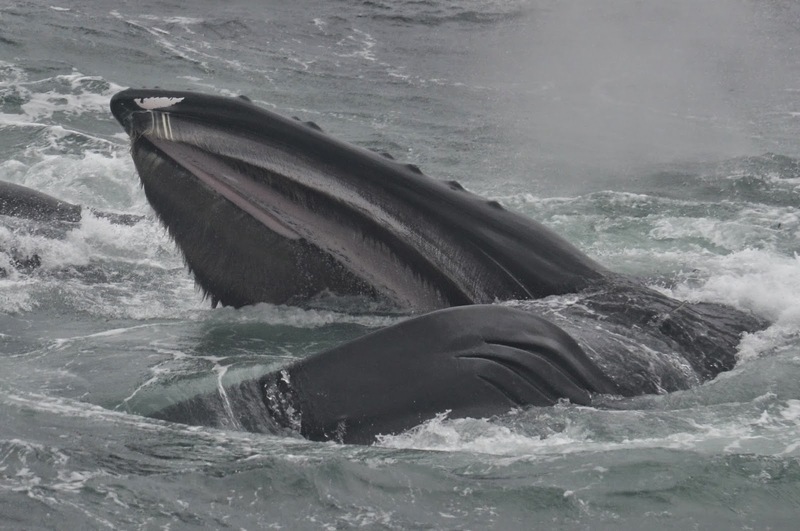 See if you can tell the difference between these two male humpback whales. Hint: Rocker has some barnacles on his dorsal fin. Hopefully the weather clears up for tomorrow.